The month of the Ox will soon be over, and the preparations for the Chinese New Year are in a full swing. We are almost there! On the 4th of February we will be celebrating the Lunar New Year welcoming the year of the Earth Pig. According to the Chinese calendar, this year is not 2019, but 4717. Over the millennia of their long history, the Chinese have observed the interaction between the nature and the people to develop their uniquely accurate forecasting tools. The Liu Bo Wen Qi Men Dun Jia divination is one of them. We are truly fortunate to be able to learn, and to use it today for our Year of the Earth Pig forecast. 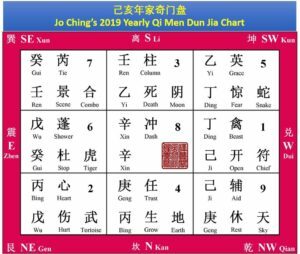 In QMDJ, the beginning of the year starts with the Winter Solstice, as this is the time when the Yang Qi starts growing. For the ancients, it was an important cosmological event. These days not many of us can enjoy the luxury of staying silent in contemplation around this time of the year, tuning into the cosmic Qi. From this point onwards, the Yang Qi is building up, and by the time we celebrate the Chinese New Year in February, it is quite strong. We can already see on our TV screens how the new trends evolve, introducing us to a different reality. So far, we have observed on the news the earthquakes, buildings collapsing, car accidents, gas explosions, avalanches, etc. We can only hope and pray for the people in the affected areas to stay safe. However, given the combination of Xin Metal, Dash and Purple White Star 8 governing the change, one has a little chance for being too optimistic. This combination symbolises not only sudden, but also the profound changes affecting people, buildings, prosperity and the social order. At the same time, the sweeping changes of 2019 offer incredible opportunities. They pave the way for the new possibilities in business, research and culture. Having reached the point of no return, we have no choice, but to transform ourselves, the way we live and the way we reflect upon the reality. The governing trigram for this year is Gen 8, Mountain. It represents the youngest son. It also symbolises a cave, an elevated structure or something hollow inside. It can also represent a corridor, a gate, or a passageway. The Gen palace in the chart gives us an idea about where this time the passageway may lead us to. Firstly, we may need to go into the dark place, before seeing the light at the end of the tunnel. We may have to deal with our emotions. As we move through the change, we will have to overcome our weaknesses and insecurities, to develop strength and vision. In this palace, we can see one of the most negative deities, Tortoise. It may represent financial losses, scary experiences or dreams. In combination with the Hurt door, it may represent being attacked. In this context, avoiding the risky sports and any extreme activities could be a good idea. The stem in the Heavenly Plate is Bing Fire. It symbolises the stock market, as well as gas and oil industries. Given the combination of the components here, we may conclude that the prices on oil and gas will not be stable due to the current global market conditions. The fuel related industries may also experience various incidents. This situation will translate into the general stock market performance, and it is highly likely, that this year many people may see their stocks dropping in value. Our advice is to be extremely cautious with the stock market investment this year. The prices for properties may also fluctuate, and for a smart investor this could mean a great opportunity for cashing in. For people trying to enter the property market, this could also be good news. However, for an investor, the general outlook for the property market is not too optimistic, as Wu Earth in Zhen palace is under penalty, in addition to destabilising impacts of the conflict between the Tiger Deity and the Stop Door. If it is neglected, the water will cause illness. This hexagram is a symbol of mutual benefit and respect. The wealth creation must be based on proper principles, otherwise it will go to waste. Given the penalty in this palace, it is likely, that we are at the end of an era of speculative economy and the ponzy schemes. It is the time of realization and adjustment. Secondly, the theme of the new beginnings, new concepts, new ideas is also very prominent in the chart. If you are a start-upper, this is your call! Those who are young, active and street smart, will be taking the world by storm, reaping the rewards in the nearest future. This is especially true for female entrepreneurs. Young women are paving the way for a fairer society, for equal opportunities and pay, for social justice, driving the change with the passion and unstoppable resolve. We can see this from the combination of the components in Dui Palace, with Beast, Chief and Open Door. Thirdly, the matters of gender identity will continue to be prominent in the media. This will result in a major change to existing law, as well as the attitudes of the society. Our understanding of gender roles will expand. The society will learn to be more open to gender variance and the resulting family types. Finally, it is worth remembering that changes are always positive in a sense, that they bring renewal. The Gen palace is a threshold between the end of the winter and the beginning of spring, where everything comes back to life. The year of the Earth Pig brings about a powerful transformation, for which we are ready. The structure and its stability will be tested. It is not only about buildings, but also about the social and the economic constructs. The stability is about the ethics and underlying principles. All of us will experience the impact of the upcoming changes, as we all belong to some sort of a social construct, such as a family, a company, or a nation. We may feel that this is the time to re-negotiate the conditions upon which these structures are based. This is especially true for larger constructs, such as the economic and trade agreements between the countries, military alliances, etc. translating into the renewed geopolitical system. With the current trade negotiations between the US and China, we can already see this happening. PS: If you are keen to learn from a sincere and skillful master who teaches the authentic Liu Bo Wen Qi Men Dun Jia Divination, do consider our 3-day complete program by Dr Anna. Do click here for the course outline and if you wish to know the differences in terms of applications between QMDJ Divination program versus the Art of War program, you can watch this YouTube video specially made for you.